Soheili, S., Alikhani*, I., Ghiasvand, N., Jafari, F., Ahmadi, F., Hosseinzdeh, L., Shokoohinia, Y. (2017). The effects of fatty acids of Nigella sativa seeds on apoptosis and oxidative stress induced by doxorubicin in PC12 cell line as a neuronal model. 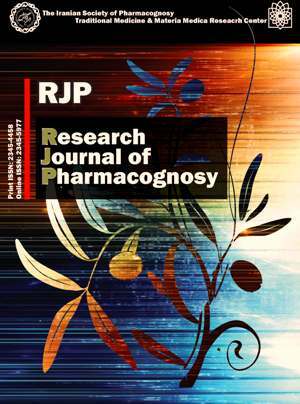 Research Journal of Pharmacognosy, 4(Supplement), 112-112. S. Soheili; I. Alikhani*; N. Ghiasvand; F. Jafari; F. Ahmadi; L. Hosseinzdeh; Y. Shokoohinia. "The effects of fatty acids of Nigella sativa seeds on apoptosis and oxidative stress induced by doxorubicin in PC12 cell line as a neuronal model". Research Journal of Pharmacognosy, 4, Supplement, 2017, 112-112. Soheili, S., Alikhani*, I., Ghiasvand, N., Jafari, F., Ahmadi, F., Hosseinzdeh, L., Shokoohinia, Y. (2017). 'The effects of fatty acids of Nigella sativa seeds on apoptosis and oxidative stress induced by doxorubicin in PC12 cell line as a neuronal model', Research Journal of Pharmacognosy, 4(Supplement), pp. 112-112. Soheili, S., Alikhani*, I., Ghiasvand, N., Jafari, F., Ahmadi, F., Hosseinzdeh, L., Shokoohinia, Y. The effects of fatty acids of Nigella sativa seeds on apoptosis and oxidative stress induced by doxorubicin in PC12 cell line as a neuronal model. Research Journal of Pharmacognosy, 2017; 4(Supplement): 112-112. Background and objectives: Nigella sativa seeds possess anti-inflammatory, antioxidant, tranquillizer, chemoprotective and antineoplastic effects. They seeds are important nutritional flavoring agents and natural remedies for many aliments. We have investigated the protective effects of N. sativa seed fatty acids against doxorubicin. Methods: Compounds from the seeds of N. sativa were purified and structures illuminated by NMR. PC12 cells were cultured in DMEM medium containing 10% v/v fetal bovin serum and 100 unit/mL penicillin. Cell viability was determined by MTT assay. Intracellular ROS levels were examined using DCF-DA. The oxidation of this molecule to flourchrome DCF results in green florescence. The intensity is considered to reflect the level to which ROS are present. PC12 cells were pretreated for different time interval with N. sativa hexane extract and its fraction then with doxorubicin. Result: We found that pretreatment with some of N. sativa fractions increased cell viability compared to cells treated with DOX alone. As anticipated, adding DOX (5 Um) to PC12 cells caused a significant increase in ROS level. The pretreatment with N. sativa hexane fraction decreased significantly. Intracellular caspase 3 level exhibited a significant decrease in caspase 3 activity and compared to cells treated with IC50 concentration of DOX alone. Compared to the group treated with DOX alone, fluorescent intensities increased after the use of some fractions. The effective components were oleic acid, caprylic acid, palmitic acid. Conclusion: The results showed that poly unsaturated fatty acids from the n-hexane fractions were able to protect PC12 cells from apoptosis induced by DOX.